Osteoblastic Metastases – Frontal radiograph of the pelvis reveals diffuse sclerosis of the right ilium compatible with osteoblastic metastases. 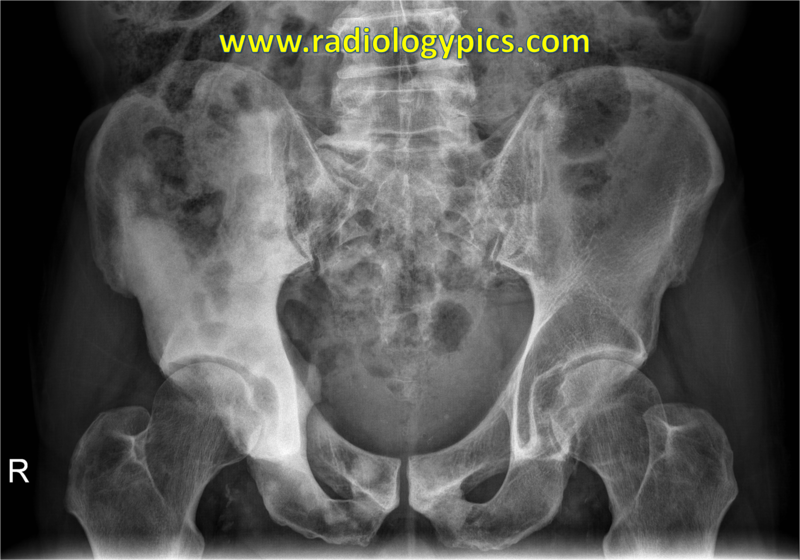 This is a case of metastatic prostate cancer to bone. Prostate cancer metastases are usually sclerotic (also called osteoblastic), leading to increased opacity on x-rays and CT scans. Prostate cancer metastases also have a preference for the axial skeleton over the appendicular skeleton. The gold standard for determining prostate cancer metastases to bone is a bone scan. Bone scans for prostate cancer have the greatest utility in the setting of prostate specific antigen (PSA) levels of greater than 20. The differential diagnosis in this case would include Pagets disease, however, there is no significant bone deformity in this case. See another case of bony metastatic disease and learn the difference between lytic and blastic metastases here.